The Rielly House was built literally at the crossroads of traffic through Richmond. It was situated at the meeting place of the Perth Road ( the major route from Bytown to Perth), and the Huntley Road (the major north-south route that joined Prescott on the St. Lawrence with the communities on the Ottawa River). It was also built at the crossroads of Richmond’s history. Before 1855, Richmond was booming. Edward Rielly estimated that 300 teams of horses passed through the village during the lumber season as men moved to and from the lumber camps of the Upper Ottawa Valley. This traffic generated a demand for accommodations for men and their horses as well as services such as taverns, stores, blacksmiths, and wheelwrights. This grand stone building is symbolic of the prosperity generated by the traffic. What do we know about the Rielly family? Why did their prosperity and that of Richmond not endure? The Rielly family is surrounded by an aura of romance. Legend has it that Edward, the family patriarch was a gambling, horse loving, Irishman who won the heart and hand of the beautiful Miss Sarah Bell of Bell’s Corners. The family story (as outlined on the McElroy family web site) recounts that Hugh Bell, Sarah’s father, eventually gave the young couple a 400 acre farm and the means to build a small hotel. After analyzing the traffic through Richmond, Edward decided to expand and build a new hotel at the crossroads. 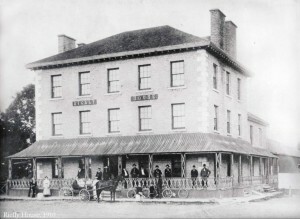 The hotel was built in 1855 at a cost of $10 000. With its 22 bedrooms and excellent dining room, the new hotel quickly became a favourite stopping place for travellers. The three-storey building measured 40’ x 80’ and had an annex of 30’ x 20’ at the back. A grand circular staircase led to an upstairs parlour. Travellers’ horses were not forgotten as Edward had large stables across Perth Street where the Richmond Memorial Community Centre now stands. Edward and his family lived in the hotel from 1857 until his death in 1876. After his death, Hugh and John, two of Edward’s 13 children, ran the hotel business from 1876 until 1926. The Rielly family soon solidified its place as a leading force in Richmond society. The family owned not only the stables across the street but also the surrounding land (the present day Richmond fair grounds) that contained a fine racetrack. Hugh Rielly rented this whole area to the Carleton County Agricultural Society for use during the Richmond fall fair from 1894 until 1927 when the Society purchased the land. Hugh also operated a stagecoach and mail line. Coaches ran daily from the Reilly House to the British Lion Hotel on Sparks Street – another Rielly-owned Ottawa hotel. Hugh married Henrietta Lewis, daughter of Thomas Lewis (a leading Richmond merchant) and his wife Mary Ann Collins. Henrietta was the granddaughter of Captain John Bower Lewis (a veteran of the War of 1812, merchant, and member of the Legislative Assembly of Upper Canada). She was also the niece of John Bower Lewis, mayor of Bytown/Ottawa and a leading lawyer and politician of Carleton County. In addition to being his brother Hugh’s partner, John Rielly, also served as village clerk in Richmond. A sister, Mary Emily Rielly, married Dr. Arthur Lyon the youngest son of Captain George Lyon. Dr. Lyon practiced medicine in Richmond for several years in the late 1860’s before moving to Shawville Quebec. A second sister, Edith Alma Rielly, was the first wife of William McElroy. Unfortunately the success of the hotel and prosperity of the village were doomed. The decline in traffic through Richmond to the lumber camps, the coming of the railroad to the village in 1911, and finally the increased use of the automobile led to the closing of the hotel in 1926. Richmond resident Bob Moore, a local railway historian, tells us that Richmond was a thriving village until sometime in the 1860s, but things began to change by the mid 1850’s with the coming of the railways. The Bytown & Prescott Railway (Prescott to Ottawa) built in 1854 served Ottawa’s Byward Market area. The Grand Trunk Railway (Montreal to Brockville and later on to Toronto) was opened in 1855. These railways would not have had a huge negative impact on the economy of the village as the easiest route to the upper Ottawa Valley was still through Richmond. The decline in the north-south traffic was compounded by a decline in the east-west traffic in 1870 when the Canada Central Railway was completed from Carleton Place through Ashton and Stittsville to Ottawa. By the time the train came to Richmond, in 1911, the demand was local in nature. As roads improved and automobiles became more popular even this traffic disappeared. There was no longer a need for a grand hotel in the village. Since the closing of the hotel, the first floor of the building has housed a variety of commercial businesses including a garage, insurance agency, hair dressing salon, and law offices while the second and third floors have been converted to apartments. Mr. May from Franktown was the contractor & his sons William and Richard did the stone work. Joseph Scott of Richmond was the carpenter. As well as the features already mentioned, one should note the heavy brackets under the eaves (an Italian influence) and the large quoins at the corners. The building originally had two sets of double chimneys but most have been removed. Although all historic photos show a hipped roof, a former owner maintains that there is evidence in the attic that the roof was once flat. Dormer windows were added to the roof line in 1978 to create an apartment on the top floor. Armstrong, Jean. “The Rielly House” files of GTHS. Curry, John. Richmond on the Jock Stittsville ON: The Stittsville News, 1993. Harrington, A.E. Early Masonry in Richmond and Goodwood Lodge No. 159 A.F.& A.M. 1819-1989. Illustrated Historical Atlas of the County of Carleton. Toronto: . H. Belden & Co., 1879. 1997 ed. Oshawa: Wilson’s Publishing Co.
Kirkwood,C. ” Businesses and Industries in Richmond”. Richmond. Richmond: South Carleton High School. Riedel, Bonny, The Heritage of Goulbourn: A Driving Tour. Goulbourn Township Local Architectural Conservation Advisory Committee, 1990. This entry was posted in Locations and tagged Agricultural Society, Hotel, Railway. Bookmark the permalink.